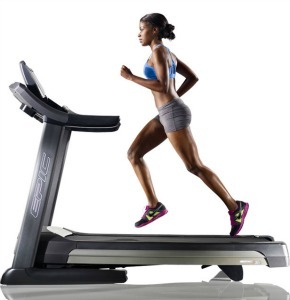 The Epic A35T treadmill features an advanced color touch screen that is perfect for interactive program training when connected to your home’s wireless internet network. The 7" full-color resistive touch screen features a built-in Android browser Powered by Google Maps™. Along with full internet access and web browsing, you also get iFit Live technology as well as 40 workout apps. The Epic A35T treadmill has a rugged 3.5 continuous horsepower motor, precision rollers (2.5" on the front and 3" on the rear), a 20" x 60" running surface with EnergyReturn cushioning, and a 2-ply commercial belt for long life. This solid 350-pound machine also offers safety features such as the new SafeZone technology which are motion sensors at the back of the treadmill that alert you if a pet or child comes up from behind. If they get too close, the machine shuts down automatically. There are a lot of other perks on this model such as the extended warranty for parts and labor, an easy lift mechanism to fold the deck up and out of the way for storage, digital speed and incline controls on the handlebars, a simple push button adjustment to change the angle of the display, 4-inch workout fan, grip pulse sensors and a wireless chest strap for heart rate monitoring, and power decline/incline that elevates the deck from -3 degrees to a height of 15 degrees. The incline works seamlessly with automated programs as the deck adjusts to simulate the hill terrain from either the workout app or with an iFit program using Google street view scenes. With these kinds of stats, the Epic A35T treadmill ($2,499) offers everything you could want in a fitness machine that emphasizes entertainment features. While we can’t tell how well the computer screen will hold up with heavy, sweaty use, at least the motor and components are above average according to user reviews. Keep in mind that the web browser technology will likely become outdated in about 2 years while the treadmill should last you up to 10 years. 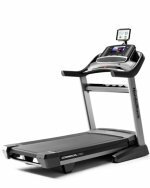 This is a nice machine but you can get a Proform, NordicTrack, or FreeMotion treadmill with similar technology and design for around $1,599 to $1,999.